Home › Life › Are you Gen Z? 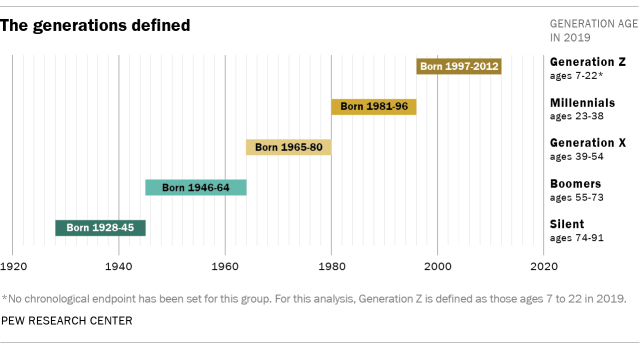 So we see that Generation Z consists of those born from 1997 through 2012, a span that includes all of my current students, most of my recent ones, and a lot of my future ones. Generational cutoff points aren’t an exact science. They should be viewed primarily as tools, allowing for the kinds of analyses detailed above. But their boundaries are not arbitrary. Generations are often considered by their span, but again there is no agreed-upon formula for how long that span should be. Millennials are the most racially and ethnically diverse adult generation in the nation’s history. Yet the next generation – Generation Z – is even more diverse. This, of course, is why Trump has to build a wall. Ignore his pretext about security. We all know the truth there. He’s scared to death about the diversity of the new generation, which will keep him from Making America White Again. So read the article in the first link above.